Home » Articles » Maintenance » Which towel to use for what job? MF towels can be designed to have certain characteristics. The microscopic fiber of the towel can be made into a few different shapes, which all have there own benefits. Knowing what towel suits what job the best can make your job a little easier. The most used towel is a drying towel, mostly because it is big and designed to hold a lot of water. You can either use the short pile or long pile side. The short pile side is preferred by some, but there is no golden rule for this. You want a firm cloth that can still absorb a lot of oils and polish residue. 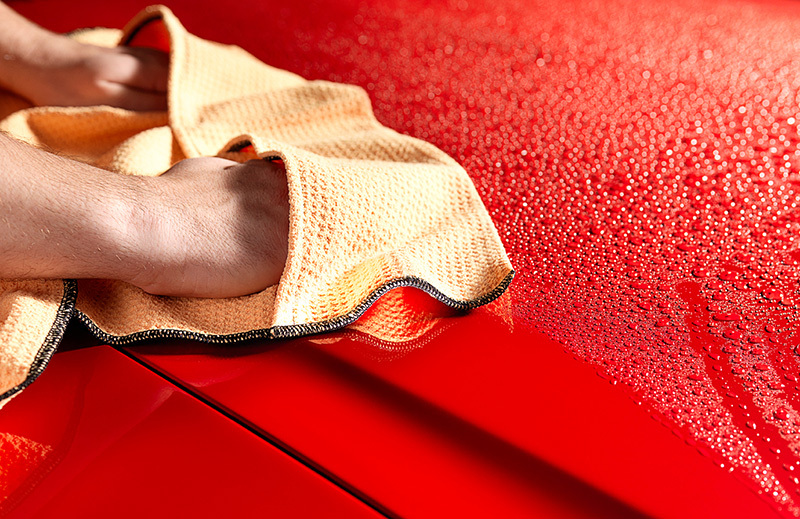 The short pile side of a buffing cloth is designed to absorb and rub away as much as possible. Good when buffing is needed. The long pile side is good at absorbing. A buffing cloth is designed to be slightly firmer and to buff as well as absorb. A very long pile buffing towel is perfect for this. The extra long and soft hair glide of the wax while still giving you the option to apply pressure to safely rub away the excess of wax residue. Although it is also a matter of taste, some people just prefer the firmer feel of a buffing cloth. When working with SiO2 coatings (or similar) you want a firm cloth that doesn’t really absorb much, but mostly removes the residue layer by polishing off the thick coat. A suede towel is very good for this. These are often supplied in the package that the coating came in. When cleaning glass you are looking for a towel that can rub away dirt, but not move it around. Otherwise you’ll just swipe to one side instead of removing it. A waffle weave microfiber towel is best suited for this. Spray the glass cleaner liberally on a normal MF towel, wipe the glass and then wipe dry with the waffle weave. When doing these types of job, the chances of coming into contact with dirt that hasn’t yet been removed is more likely then when cleaning the car. For this reason it is often recommended to use old and worn microfiber towels. Don’t use your new and good ones, but use the ones that are old and worn. If they get damaged or dirty beyond cleaning, it won’t be such a problem. When cleaning wheelarches you are still likely to get into contact with a little dirt that you forgot to remove. You don’t need to use your oldest and most worn towels, but you also don’t want to use the new ones. There are also MF towels that are designed for general use, which are often fairly cheap. The general usage MF towel can be used for this job, but you also have the choice of a long pile or short pile suede cloth. These have the benefit of being practically lint free, good ad buffing and even have a slight polishing effect.